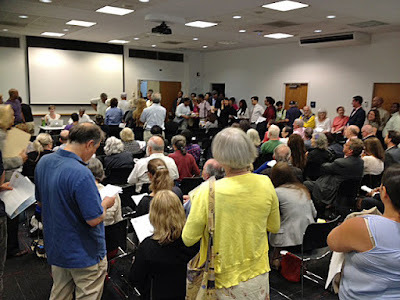 Wednesday, June 17th, the FIRST EVER public hearing about the proposed sale and shrinkage of an important New York City library, was held before Brooklyn Community Board 2's Land Use Committee. The proposed sale and shrinkage is of the Brooklyn Heights Library, Brooklyn's central destination library in Downtown Brooklyn on Cadman Plaza West at the corner of Tillary and Clinton. In recent years New York City library administration officials proposed to sell, or actually sold, other libraries, but no public hearings were required, because unlike this present situation, even though those libraries were funded mostly and very heavily by the city, those libraries, the Donnell Library, the Mid-Manhattan Library and SIBL (the Science, Industry and Business Library) were not owned by the city. The latter of these two proposed sales were supposed to be part of the NYPL's Central Library Plan. It would have also destroyed the stacks for the 42nd Street Central Reference Library's research books. No hearings were required because, as noted, the city didn't own the land being sold, but it would have been far better if public hearings had been held when those other sales were proposed because the transactions, handing out juicy deals to the real estate industry, did not stand up to scrutiny. The November 2007 sale and shrinkage of the 97,000 square foot Donnell Library on 53rd Street across from MoMA, one day supposed to be "replaced" by a 28,000 square foot, largely underground, largely bookless library is now universally recognized to have been a colossal mistake, even sheepishly by library administration officials. The sale, a huge loss to the public and even shrinking the library down to less than one-third size, netted the NYPL considerably less than $30 million while the penthouse in the fifty-story building replacing it on what was documented to be the highest value block in Manhattan is being marketed for $60 million. The NYPL would have been deeply in a financial hole, suffering a significant cash loss from the sale if it had endeavored to replace the Donnell Library with a full-scale equivalent of the library sold rather than shrinking it down to a fraction. The de Blasio administration ultimately defunded the Central Library Plan involving the sale of Mid-Manhattan and SIBL in what was a similar drastic downsizing of publicly owned library space and assets, selling off over 400,000 square feet of library space to cram it into just 80,000 square feet. Only after the Central Library Plan was derailed was it revealed that this shrinkage and divestiture of assets was going to cost the public over one-half billion dollars. Exactly how much more we still don't know but that half billion figure is hundreds of millions more than what the NYPL was previously publicizing to be the plan's cost. Why the discrepancy? Why were these deals so bad for the public, so almost inconceivably worse for the public than could be imagined in ways that were not openly represented by library administration officials to be the case? The best answer is that they were really being done as favors for the real estate industry for whom the deals were very beneficial. Now CB2 finds itself with another such library deal, the proposed Brooklyn deal, that's closely modeled to replicate the Donnell sale, another luxury tower squashing down an important library to just one-third size. 1.) Brooklyn Public Library administration officials are supposedly proposing this hand-off to a developer in order to bring in funds for libraries. The problem with tha is that this pretense doesn't bear scrutiny because, as CB2 committee members noted, there is absolutely no assurance any funds from a sale and shrinkage would go to the libraries. . . for two reasons, actually: a.) because any funds would go to the city that now displays a tendency to withhold funds from the libraries and there'd never be a way to trace the funds or assure they had actually come back, and b.) when you do the math and pierce through the BPL's lack of transparency on the subject, the amount of cash netted with the BPL incurring this huge public loss, like Donnell, is a paltry sum and perhaps less than zero. 2.) The committee, taking note of the imbalance of what is now fast-paced development in the area with the provision and maintenance of public infrastructure, previously voted that it should not approve any huge new developments while severe overcrowding at PS8 continues unaddressed. PS8 is currently at 140% and soon faces worse. Approving the sale of the library for more development would amount to overturning the committee's previous vote. 3.) In order to obtain a bonus and build a bigger building while also trying to generate public support for the selling off the library's assets, the developer is proposing to build so-called "affordable" housing units at two other sites. Committee members noted that with a sort of quintessential "poor-door," in-your-face bravado the developer is choosing to put these units in a far less desirable location than increasingly fashionable Brooklyn Heights, where the units in the luxury tower replacing the library would be marketed. The result would be various forms of gentrification: Those wanting to curtail the many visitors coming to the vicinity of Brooklyn Heights when they use the downtown neighborhood would achieve their aim, plus a high-end luxury building would be built on the Brooklyn Heights border . . . any lower income residents would get settled at a far remove. Facing these and other concerns the Land Use committee deadlocked, refuse to recommend the BPL's proposed sale and shrinkage. "Poor Door": One location where a few "affordable" units would be built resulting in. 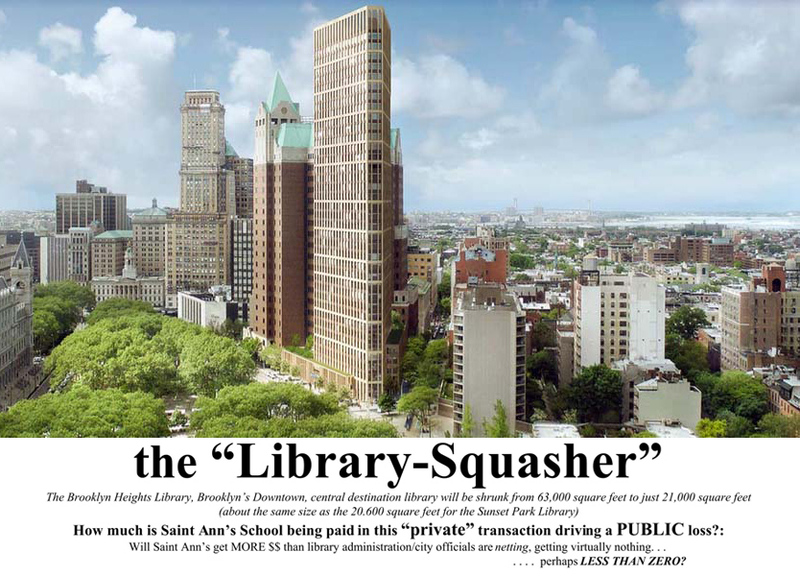 . .
Click to enlarge if you dare- The Library-squashing tower that would benefit Saint Ann's private school and a developer if built, but not the public. Other things are also on the minds of CB2 members. 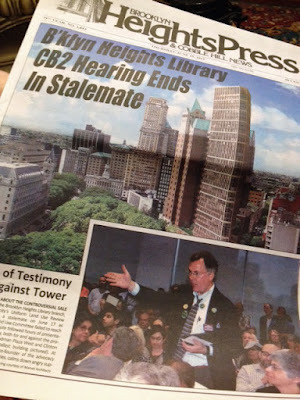 Ultimately the entire CB2 board will be asked to vote on the sale and shrinkage of the Brooklyn Heights library the BPL officials are recommending. At a meeting where the BPL presented the proposed sale and shrinkage to the CB2 Youth and Education Committee one member asked why so much of the proposed "replacement" library had to be underground. The answer? : Money. Unless the library is shrunk way down and as much as is currently proposed to be underground, is put underground, the nominal amount of money (if any?) the library is netting when it sells off this significant asset would be so little as to be laughingly imperceptible when presented as the supposed justification for the sale. Also on the mind of one of that committee's members: Sometimes when you visit the library you find people who are observable as probably homeless and, for some people, that's depressing. From canvassing and talking with users outside the library (I am a co-founder of Citizens Defending Libraries) we know that there are also a fair number of users of the library, people impeccably dressed and groomed as they look for jobs, that you would never suspect to be homeless, but, in Will Smith-"The Pursuit of Happyness" fashion, they are. Yes, and there are also people with low incomes who's could be in danger of becoming homeless without support they get from the library. Frankly, a full range of people use the library, myself included. As for the conundrum of how best to treat the perceptibly homeless: That's a management question. Swapping the existing library for a smaller one or one that has new surfaces and furniture has nothing to do with what decisions are made when that kind of management challenge is grappled with. Another CB2 member suggested that our Citizens Defending Libraries opposition to the sale and shrinkage of the library should focus more on the value of the existing library to the public (it has a dollar value to the public of well over $100 million) and how little the BPL is proposing to sell the library for, perhaps netting less than zero. Conversely, this CB2 member suggested that it is not important or relevant that Saint Ann's, a private school, will be getting a huge payday if the library is sold. This is because, if the library is sold and shrunk Saint Ann's will be able to get paid for transferable real estate development rights, walking away with a free-and-clear amount that may exceed the cash the city is netting when it sells the library. This CB2 member told us that we should not begrudge Saint Ann's its payday, because the school is entitled to benefit by selling what it owns and that we should not be concerned if Saint Ann's is working hard behind the scenes to lobby local politicians for the sale and shrinkage of the library. `You can lobby elected officials against the sale,' this CB2 member told us. We can do it behind the scenes if we want and we can wine and dine elected officials in the process he said. There is truth to some of this analysis, but mostly we disagree. Among other things, we probably don't have the same kind of access, nor can we reach deeply into our purse believing that any war chest expenditures will be more than replenished by a coming payday. The fact that we know this CB2 member to be a significantly close confidante and advisor to one of our more important elected officials makes us wonder whether this is advice that has been given to that elected official and whether it is reflective of the kind of lobbying that Saint Ann's is doing behind the scenes condoned at least by some. Certainly, if nothing else, the influence that Saint Ann's has had with respect to Brooklyn Heights Association relating to this proposed transaction is improper. And the Brooklyn Heights Association has, indeed, taken a very odd position supporting the transaction that would benefit Saint Ann's. That matters a lot. One example of how it matters? : The Daily News printing its editorial defending this real estate transaction prominently advised its readers of the BHA's support. In the editorial it seemed as if the Daily News was working hard to ridicule those opposing the sale and shrinkage of libraries and wanted to suggest that those doing so don't have that right. So these are just some of the things the CB2 members are considering as maters of concern when debating this transaction. There are a good many more for them to think about as well. The BPL is not being transparent about what it is doing. That includes not releasing documents like its "Strategic Real Estate Plan" (dating back to 2007) and "The Revson Study," both of which would help the public to know which libraries the BPL will target as real estate deals next. The BPL also worked with the developer to cynically release hundreds of pages of withheld environmental documents (along with all sorts of other documents) in an information dump two days before the hearing on the 17th and those documents have some startling revelations. How Self-Contradictory Can The Brooklyn Heights Association Be As It Advocates Sale And Shrinkage of The Brooklyn Heights Central Destination Downtown Library? The Brooklyn Heights Association has now taken three solidly self-contradicting positions as it digs in to argue for what's an obviously absurd stance for it to be taking in the first place: its promotion of the sale and shrinkage of the Brooklyn Heights Library, Brooklyn's central destination library in Downtown Brooklyn on Cadman Plaza West at the corner of Tillary and Clinton. • First, the BHA now arguing for the shrinkage of a library that it previously advocated be enlarged and which was, in fact, thereupon enlarged and considerably upgraded at appreciable public expense and inconvenience, reopening in the fall of 1993.
. . Calling for the shrinkage of a library the BHA had previously called for the enlargement of?. .
. . . That's inconsistency Number 1. • Then, how is it that when Citizens Defending Libraries (of which I am a co-founder) asked the Brooklyn Heights Association to call for proper funding of New York City libraries so that the Brooklyn Heights, Mid-Manhattan, SIBL and Pacific Branch libraries would not be sold, the BHA refused to call for proper funding, saying such funding was NOT a neighborhood concern?. . . BUT NOW--- The Brooklyn Heights Association is calling for the Brooklyn Heights Library to be sold because (supposedly) the sale and shrinkage would mean that libraries in other neighborhoods would get better funding? . . . Actually, that is such a treacherously false belief about funding as to be patently silly, because there is no guarantee that money would actually go to libraries, this library is being sold off at a huge public loss in a transaction that may net less than zero cash, and selling off libraries to developers as a self-cannibalizing funding program may simply foster more underfunding. Switching from saying that proper funding of NYC libraries is not a BHA or neighborhood concern to saying that it is an important enough BHA and neighborhood concern so that it's a reason to sell off the Brooklyn Heights Library is inconsistency Number 2. Public school overcrowding will be exacerbated by the additional development. PS 8 is already operating at more than 140% capacity and turning away local kindergarteners for this Fall. Right! . . . But tearing down and shrinking a library supporting educational pursuits and consequently the school system isn't a similar problem, or an even greater exacerbation of it? That's inconsistency Number 3! . . .
. . . Three strikes and you are out? Why then might we theorize the Brooklyn Heights Association wants to be so terrifically, consistently inconsistent when it comes to wanting to see the library sold? • How at the June 17th Brooklyn Community Board 2 Land Use Committee hearing about selling and shrinking the library the developer refused to say what Saint Ann's school is being paid as a result of the library's sale and shrinkage because,"it's a private transaction". . . He said that even though this private transaction is driving a public one! 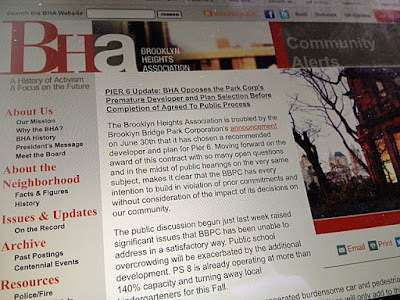 • How Saint Ann's-connected people are deciding for the Brooklyn Heights Association that the BHA should promote the sale and shrinkage of the library. Friday, June 26, 2015, Embarrassment of Past Riches! : Augmentation of NYC Book Space At Two Business Libraries Simultaneously- Only Recently The Brooklyn Heights Association Fought For Larger, Not Smaller Libraries. Brooklyn Hts Blog: Who do you support? Who then do we want to trust on this? Do we want to trust the consistently inconsistent Brooklyn Heights Association? 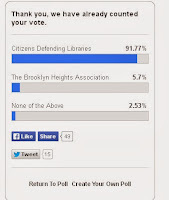 Or as the Brooklyn Heights Blog asked after the 2014 Brooklyn Heights Association annual meeting: Who do you support, the BHA or Citizens Defending Libraries? 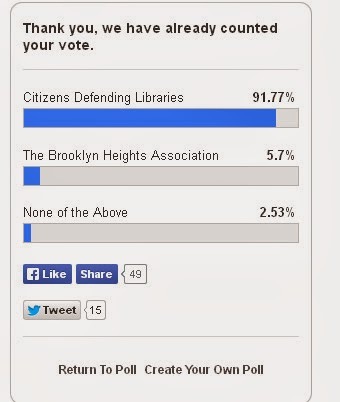 I think it's pretty clear: If the Brooklyn Heights Association wants to truly represent the community and the public interest, as is its responsibility to do, it's time for the Brooklyn Heights Association to contradict itself just one final time, changing its position to oppose the sale and shrinkage of the library, and the BHA should do so now while doing so can still have a beneficial effect on the process. . . It would be the most consistent thing it could do and the thing most consistent with the public's interest.